The First Canned Dog Food In America Was Created To Dispose Of Excess? Henry Ford might have gone down in history as the assembly line innovation genius—and in fairness, he was—but his iconic Model T car wasn’t the first assembly line produced car. That distinction belongs to the, rather literally named, Curved Dash Oldsmobile, first manufactured at the turn of the century. Before Ford, automotive businessman Ransom E. Olds increased the output of his car factory by approximately 500 percent by instituting two simple changes. First, his cars used interchangeable parts. 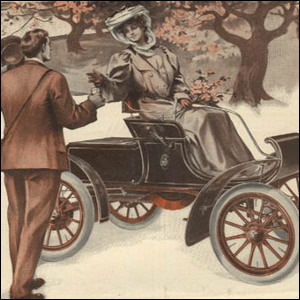 That seems like a given now, but in the early days of automobiles, each car was handcrafted and more akin to a handmade wagon rather than a machine assembled in a factory. Second, he introduced the idea of assembly line construction to the auto industry. His assembly line technique was a stationary one, however, where the cars stayed in one place, but the workers moved down the line with carts to attend to each step of the production process. Where Olds was overshadowed by Henry Ford was Ford’s innovation to have the assembly line move instead of the worker. None the less, the Curved Dash Oldsmobile stands as the first assembly line produced vehicle in America. Image courtesy of Saturday Evening Post/The Jumping Frog.